Fluffy baked potatoes, perfectly cooked every time! 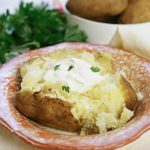 Baked potatoes are made quick and easy your pressure cooker! Wash the potatoes under cool water. Scrub and clean the potatoes well. Prick each potato with a fork to allow steak to escape. Add a stainless steel steam rack or basket, to the bottom of the pressure cooker. Next add the potatoes, stacking evenly. Now add the water, add the water. Close and seal the lid, set the valve to seal. Set timer for 10 minutes. Natural pressure release (NPR) at the end.